When musical tabataire movement wound with pull-string, main action movement wound with key, both start/stop controls actuated, and a lit cigarette placed in his holder, the magic starts immediately, with his right hand with the holder raising up to his mouth, inhaling, lowering his hand whilst turning head to the left, to the right, then twice more all the while exhaling out of mouth before taking another pull from cigarette, repeating all the time until the cigarette reaches the end. All accompanied by the sweet tonal melodies of the cylinder musical movement. 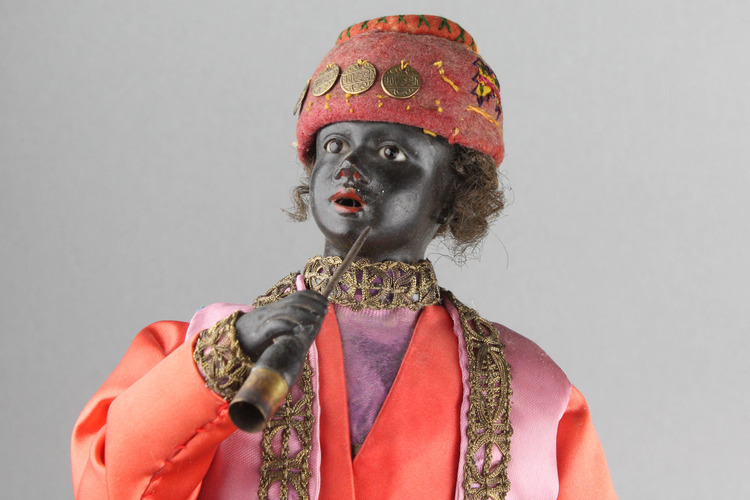 The standing Moroccan man with black bisque head and wonderfully set glass eyes, red detailed lips and nostrils, micro-curled black hair wig under traditional red felt hat with yellow and black stitchwork embellished with circular gilt metal medallions, red seamed cap top, matching black bisque hands and fingers, holding cigarette holder of tinplate to resemble gold. Dressed in light red and soft purple silk trousers, shirt and jacket, finished with black and gold lace trims to lapels and hems. 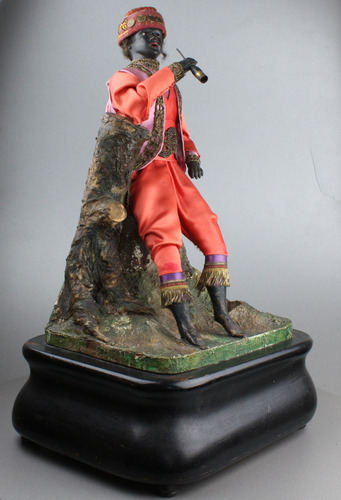 Posed slouched against dead tree stump cluster of finely detailed painted textured rolled cotton and papier-mâché, on moulded ebonised square base with twin start/stop controls for action and music, pull-wind for musical movement and key spindle for action to right-hand side. Mention the name Bru to any doll collector or noted doll and toy museum, and they will become rather excited. 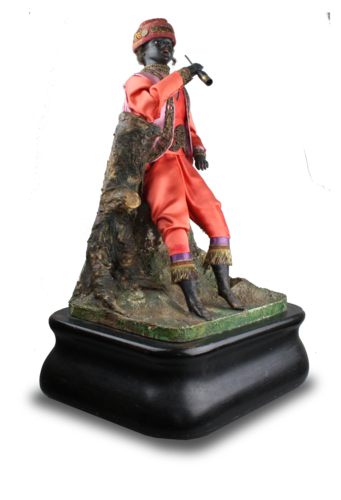 It is known that respected automata manufacturers operating in France in the late 19th century commissioned firms such as Bebé to cast for them heads for use on titled and themed models - the Tea Server by Lambert for instance. 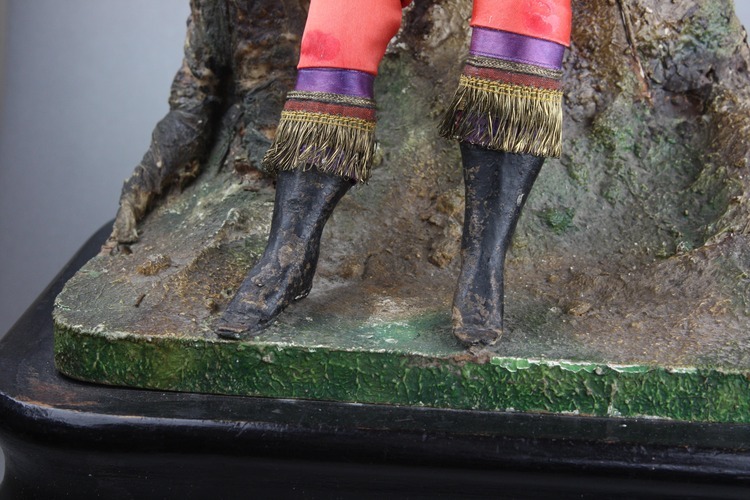 Phalibois and Vichy were two such firms with the credibility to exercise the outsourcing of work to the best bisque artists known for producing the finest dolls. Now although this head is not marked Bru, or impressed with the usual mark of a dot below a crescent moon, not all Bru castings were marked. By the time Bru stopped in circa 1899, the last ten or so years saw them release the majority of wares mark-less. 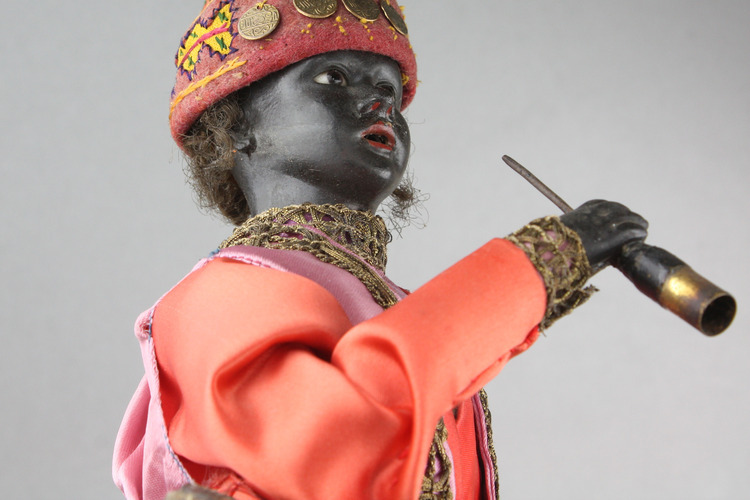 Eugene Barrois of Paris was one of the suppliers to Bru, so it's interesting to see that whilst automata makers commissioned people like Bru for heads, Bru themselves used others as well. One cannot ignore the close resemblance of the features Bru were renowned for in this head. The puffiness of the cheeks, the inset depth of the eyes and the tonal hue of the bisque itself being of the same at the back than at the front, not forgetting the overall proportions of the head-to-neck scale. The black mohair wig uses tiny stands of hair, much finer grade than seen on others of the same height. When this little man smokes, he really smokes. Smoke bellows out of his mouth; the workings, of such simple cunning, produce an effect outstanding in the world of surprise. And with music set on or off independently, one can choose action only, music only or both together. The finest smallest musical smoking automaton yet seen by the world.